The play started after the national anthems of both teams were played in front of a packed stadium. Russia’s ball play from the very 1st minute was exceptional. Meanwhile, Saudi Arabia were struggling to take the ball in their opponents half. And, Russia’s dominance was awarded as Yuri Gazinskiy scored the opening goal with the help of an assist by mid-fielder, Aleksandr Golovin. Russia substituted Alan Dzagoev for Denis Cheryshev at the 25th minute of the match. And, with precision and accuracy, Denis struck a goal just before the close of the 1st half. 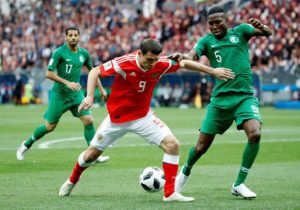 The 1st half came to an end, with the Russians in the lead by 2 – 0 and unsurprisingly, Saudi Arabia hadn’t even a single shot at their opponent’s goal. The 2nd half went underway and Saudi Arabia’s defence was quite better in the 1st part of the 2nd half. But, Saudi’s defenders couldn’t hold Russia for too long as Artem Dzubya scored a goal with a 2nd touch to triple Russia’s lead. At this point, Russia Vs Saudi Arabia became pretty much one-sided. The play was now coming to an end and Saudi Arabia were now looking for a consolation goal. But, Russia weren’t finished yet as in the 2nd half’s injury time Denis Cheryshev made a successful shot with his outside foot to net the ball and quadruple Russia’s lead. 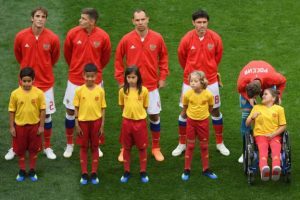 Further humiliation rained down upon the Saudis as Aleksandr Golovin scored a goal off a free kick as Russia handed their opponents a daunting defeat of 5 – 0. FULL TIME: Russia 5-0 Saudi Arabia. Join allsportspk tomorrow for the next matches of FIFA World Cup 2018.